-16 database exchange from 1 TB each - DB only active on EXC01 and Exc02. Why are two day logs left? Other software backup products truncate logs and only logs remain after the backup schedule. it's normal for veeam backup exchange log for 2 days? And what about SQL tab? on five database exchange logs 4 Db have date back to 3 days ago, and 1 DB have date back to 2 days ago. Yep, the settings seem to be configured properly, and I was about to suggest you to reach our support team for further troubleshooting. Glad to know you've done that already. Keep us posted. I can confirm that backup process has finished successfully on Veeam side and truncation was requested, which can be seen in logs and events. The rest of the process lies entirely on Exchange server side. From my understanding this is indeed working correctly. Information 07/10/2017 04:26 MSExchangeRepl 2046 Exchange VSS Writer "The Microsoft Exchange Replication service VSS Writer instance ee7e2b49-878a-4ff6-80cb-953d65ba13c6 has successfully completed the backup of database 'DBXX'. Database log truncation has been requested for this database. Log truncation will occur on the active copy after the next log generation is created. Log truncation will occur automatically on the passive copies after that log file is copied." Please note the last part of this message - truncation does not always occur immediately after the backup is complete. Does your DAG contain lagged copies by chance? Exchange will not truncate logs that have not yet been replayed to the passive copies. If you're running lagged copies check your DAG replication and make sure there aren't 2 days' worth of logs in the replay queue. First one will return all the passive copies of databases and their attributes. Second one is more specific to log files and lag copies. It does sound like Exchange is not happy to delete the log files for some reason. thank you for the info, i dont have lagged copy at the moment. Did you ever solve what was the problem? I have exactly the same problem with sama architecture. Hi, Petteri, and welcome to our community forums. May I know you support ticket ID for this issue? Thanks. 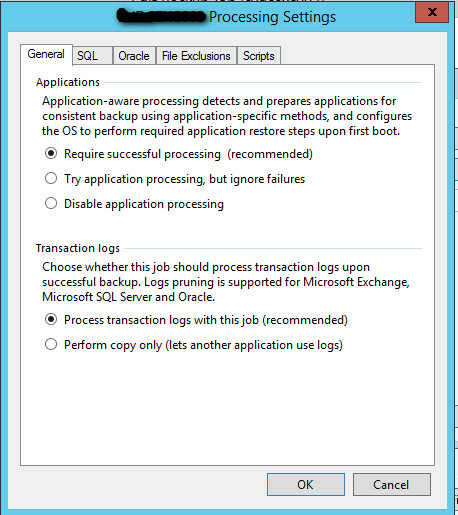 I have an issue too with log files not truncating, although on Exchange 2010 DAG. My settings are the same as the OP's screenshots. I am on Veeam 9.5.0.1536. 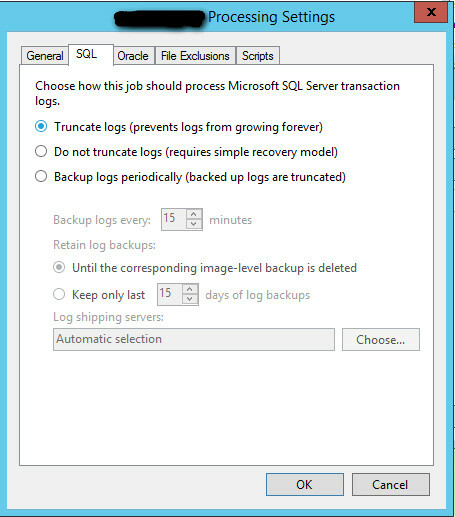 In case of a DAG a certain amount of logs could stay on the disk after a backup job. Could you check if the name or dates of the logfiles are changing?